Up to late-1840s, the Judiciary found quarters in other people's houses. At the end of 1846 the King's Privy Council resolved to authorize funds and have Governor Kekūanāoʻa’s stone house within the old fort of Honolulu “be turned into a court house for the foreign judges and Hopkins’ house for a district court house, said houses however to be put in good condition.” Back then this was at the water’s edge. An act to organize the judiciary department of the Hawaiian Islands was passed in September, 1847. It set up a superior court and otherwise assembled the machinery of law and order. Beginning early in 1851, as a combined courthouse and jail, work was soon halted "on account of the depth of water found upon the foundation rock, which rendered it impracticable to proceed." When work was recommenced in June, the jail had been dropped and the plans for the new building called only for one that would "serve the purposes of the Legislative Assembly, as well as for holding the Courts." In October, sixty prisoners were used to cut coral blocks for the Courthouse. One night while staying in houses near their work place (in order to take advantage of a low tide very early in the morning,) forty men overpowered the guards and seized the gun batteries overlooking Honolulu. Loaded cannon were trained on prominent buildings. But the prisoners lacked fire to set off the pieces. The prisoners were captured and order was restored in the morning. 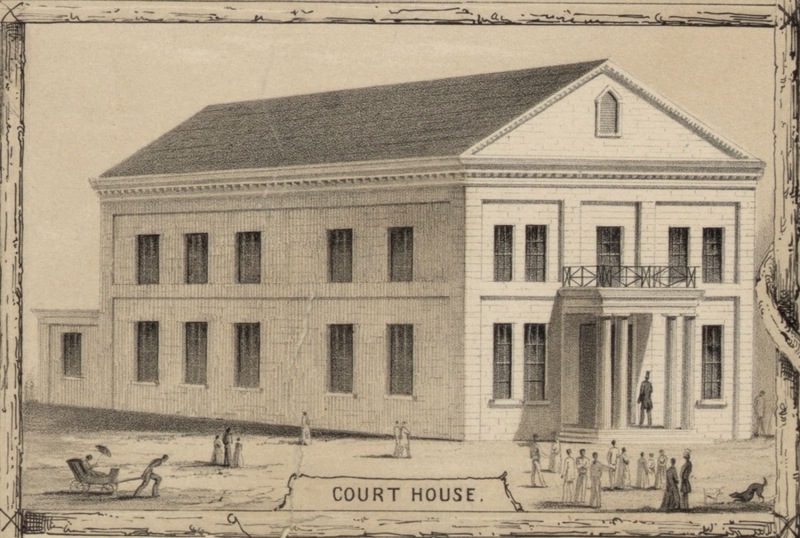 On July 5, 1852, the superior court of the Kingdom of Hawaiʻi met for the first time. At the time, it was the second largest building in the kingdom and served concurrently as a courthouse, parliament house and civic center. Judge Lee opened the session of the superior court with an address in which he asked those in attendance to "pause a moment, as we meet for the first time in this temple dedicated to justice, and reflect upon our duties as lawyers, as jurors, and as judges." He continued, “Justice in a grass house is as precious as justice in one of coral, but no one can fail to agree with me, that the latter with all its comforts and conveniences is greatly to be preferred, inasmuch as it tends to promote that dignity and propriety of manners so essential to secure a proper respect for the law and its administration. May this Hall ever be the temple of Justice - may its wall ever echo with the accents of truth - may its high roof ever look down upon us in the faithful discharge of our duties — and may the blessing of Him who builded the Heavens and whose throne is the fountain of all justice ever rest upon us." 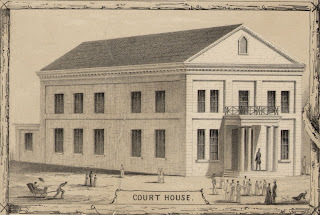 When the court house was built, the city gained a new and bigger set of public rooms. The result was that the chambers dedicated to the government’s judicial and legislative processes were the scene of a variety of private and community functions. In addition to its official function as a courthouse and legislative hall, the building was frequently used for public meetings. The congregation of the Second Foreign Church of Honolulu announced it would use the new court house for its services. Among the more colorful events to be held at the courthouse were the festivities given during the reign of King Kamehameha IV. On November 13, 1856, the Chinese merchants of Honolulu and Lāhaina combined to give a grand ball to their majesties King Kamehameha IV and Queen Emma, in honor of their recent marriage. Almost the last official action to take place in the courthouse was the special session of legislature, called for February 12, 1874, to elect a successor to King Lunalilo, who had died without having designated an heir to the throne. Lunalilo himself had been elected king in this building on January 8, 1873, after Kamehameha V died without issue and without having proclaimed an heir on December 11 of the preceding year. In accordance with the provisions of the constitution in cases where the previous occupant of the throne failed to nominate or proclaim a successor, the cabinet of the late king called a meeting of the legislative assembly to "elect by ballot some native alii of the kingdom as successor to the throne." Such a meeting was ordered by the cabinet for noon Feb. 12. With the Court and Legislative functions in the old Courthouse ended, the regular session of the legislature for 1874 met on April 30, 1874 in the legislative hall of the new government building - Aliʻiolani Hale. The old Courthouse was advertised for sale at auction in the Pacific Commercial Advertiser of May 9, 1874. The courthouse property was sold to H. Hackfeld & Co., predecessor of American Factors, Ltd. (AmFac – one of Hawaiʻi’s Big Five,) at the upset price of $20,000. As reported by the Hawaiian Gazette, "It is the best business stand in Honolulu." The image shows the old Courthouse as drawn by Paul Emmert in 1854 – shortly after the building was completed. In addition, I have included other images of the building in a folder of like name in the Photos section on my Facebook and Google+ pages.